Tigaghi, quit sishi, and the siddapady regiment can blend together to form a very unusual regiment - the Sabbadipady regiment (a.k.a. the Blends) - I discovered this regiment in 1998. The members of this regiment look quite a lot like siddapady members, but they have strange looking verfs. 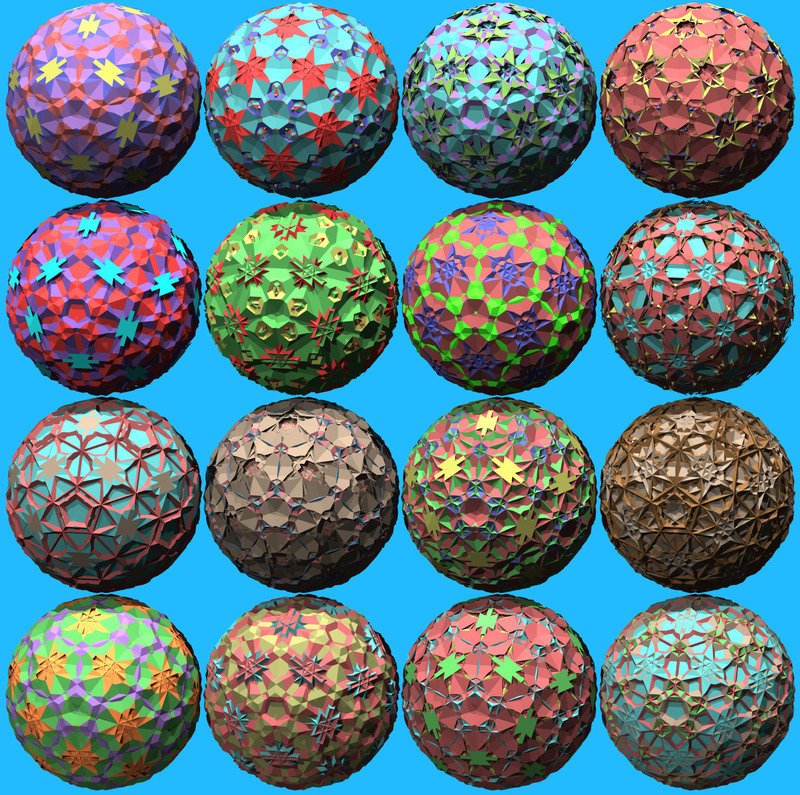 These polychora all have hyic symmetry and 2400 vertices. These eight are the typical members of this regiment. Sanbippady and ganbippady are the only wild cases, all others are tame. 1462. Sabbadipady - (SAB a DIP a dee) small blendic disprismatodis120. Its cells are 120 quit sissids, 120 gissids, 720 pips, and 720 stips. It has 18840 pieces in 6 types. LOC = 65. It is orientable. 1463. Gabbadipady - (GAB a DIP a dee) great blendic disprismatodis120. Its cells are 120 tigids, 120 does, 720 pips, and 720 stips. It has 169,680 pieces in 30 types. LOC = 479. It is orientable. 1464. Sabippady - (sa BIP a dee) small blendic prismatodis120. Its cells are 120 quit sissids, 720 stips, and 120 radeds. It had 93600 pieces with 15 types, with LOC = 214. It is non-orientable and likely has a new piece count. 1465. Gabippady - (ga BIP a dee) great blendic prismatodis120. Its cells are 120 tigids, 720 pips, and 120 radeds. It had 175,680 pieces in 24 types, with LOC = 578. It is non-orientable and likely has a new piece count. 1466. Sabbathi - (SAB a thee) small blendic tris120. Its cells are 120 quit sissids, 120 gissids, and 120 ideds. It has 17400 pieces with 5 types. LOC = 53 - it is simpler than its colonel sabbadipady. It is orientable. 1467. Gabbathi - (GAB a thee) great blendic tris120. Its cells are 120 tigids, 120 does, and 120 ideds. It has 95280 pieces with 17 types. LOC = 307. It is orientable. 1468. Sanbippady - (san BIP a dee) small spinoblendic prismatodis120. Its cells are 120 quit sissids, 720 pips, and 120 ris. It had 35280 pieces with 6 types, with LOC = 91 with the CAW filling. It is non-orientable. 1469. Ganbippady - (gan BIP a dee) great spinoblendic prismatodis120. Its cells are 120 tigids, 720 stips, and 120 ris. It had 200,400 pieces with 26 types, with LOC = 640 with the CAW filling. It is non-orientable. Quitdids can show up within this regiment, although they don't show up in the three regiments that blended to form this regiment. There are four of these. Its also interesting to note that idtids can also fit in, but they can't connect properly to form polychora. These are all tame. 1470. Sanbathi - (san BATH e) small spinoblendic tris120. Its cells are 120 gissids, 720 stips, and 120 quitdids. It has 31800 pieces with 6 types. LOC = 113. It is orientable. 1471. Ganbathi - (gan BATH e) great spinoblendic tris120. Its cells are 120 does, 720 pips, and 120 quitdids. It has 543,120 pieces with 54 types. LOC = 1599 - most complex of this category. It is orientable. 1472. Bathi - (BATH e) blendic tetrakis120. Its cells are 120 gissids, 120 does, 120 radeds, and 120 quitdids. It has 138,360 pieces with 17 types. LOC = 307. It is orientable. 1473. Badohi - (BAD a hi) blendic dis120. Its cells are 120 ris and 120 quitdids. It had 80640 pieces with 9 types, with LOC = 226 using the old CAW filling. It is non-orientable. There are four fissary cases. Piece counts and LOCs haven't been counted for these yet. The first two are tame and the last two are wild, all are orientable..
F24. Badipady - (ba DIP a dee) blendic disprismatodis120. Its cells are 120 quit sissids, 120 tigids, 720 stips, and 720 pips. F25. Bithi - (BITH e) blendic tris120. Its cells are 120 quit sissids, 120 tigids, and 120 ideds. F26. Sabipthi - (sa BIP thee) small blendic prismatotris120. Its cells are 120 gissids, 120 quitdids, 120 ideds, and 720 pips. F27. Gabipthi - (ga BIP thee) great blendic prismatotris120. Its cells are 120 does, 120 quitdids, 120 ideds, and 720 stips. There is also one lone compound which is the compound of quit sishi and tigaghi. Depending on how we look at it, it could be uniform or biform (two types of vertices). If we consider it to have 2400 vertices that have a compound verf, it is uniform. But if we consider it to have 4800 vertices that coincide in pairs, it is biform instead. It is orientable and tame. The verf and a cross section is pictured above. C. Badhidy - (bad HI dee) blendic dis120dis120. Its cells are 120 quit sissids, 120 does, 120 gissids, and 120 tigids. Below is a cross section of each of the blends in order. Below shows how the blends pair up as conjugates. The following are self conjugates: bathi, badohi, badipady, bithi, and badhidy. The following are conjugate pairs: sabbadipady-gabbadipady, sabippady-gabippady, sabbathi-gabbathi, sanbippady-ganbippady, sanbathi-ganbathi, and sabipthi-gabipthi.